Bruno Zach (1891-1935), Dutch sculptor who worked in Berlin and Vienna. Statuette of bronze and ivory, on a socle from onyx, made around 1920. Beatrice Wood (1893-1998), American painter who spent a year with Gordon Craig in Italy in 1915. 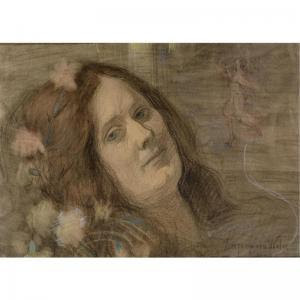 "Portrait of Isadora Duncan", 1917, watercolor on a pencil drawing, 24.2 x 15.3 cm. Abraham Walkowitz (1880-1965), American painter. Watercolor studies of Isadora Duncan, made between 1908 and 1917, from the Duncan Collection.